Travel is exciting. It gives us the opportunity to submerge ourselves in someplace new. To see new landscapes, architecture, wildlife, people, as well as food. While traveling somewhere, the food inspires us and it tells a story about a culture. It is unique and it is able to be experienced – sometimes on a more personal level than the surrounding area itself. You can taste the battle between tradition and innovation in Chinese street food, the masterful attention to detail in an Italian pizza, and the Cuban kick that comes with a bite of Ropa Vieja. Here’s what makes these experiences so unique: you can bring them home with you. You may no longer wake to the sounds of a Costa Rican jungle, or breathe in the sharp, crisp air of the mountains of Patagonia. However, you can still recreate a piece of your voyage in the kitchen. 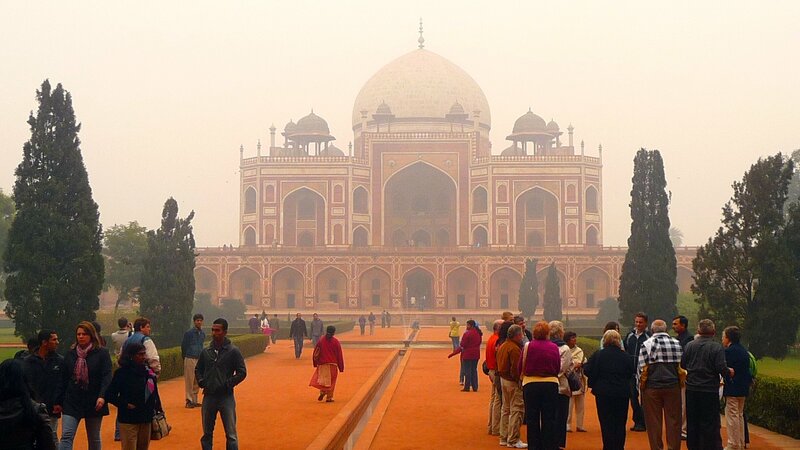 Let this post take you to India as we explore the complex cuisine and the exquisite spices and flavors that contribute to this country's bold reputation. Indian food is influenced by a multitude of factors that contribute to their wide range of flavors and combinations. The country hosts a variety of soil types and climates that cause the plants and spices within different regions to change. In addition to this, the country has been influenced by the Middle East, Central Asia, various foreign invasions, trade, and colonialism that took place over time. What goes into the dish can depend on anything from the cultural traditions of the region to the family preferences and religious practices. For many years the majority of the population was Hindu, who did not eat meat out of respect for all living creatures. Their proteins came from the beans and lentils that still dominate many dishes today and the powerful spices were used to make their vegetables more interesting. Later on, Muslims entered the region and brought along their knowledge of grilling meats and incorporating dates and nuts into many Indian desserts. Today, we are left with an eclectic combination of these takes on Indian cuisine. Common spices include coriander, cumin, cardamom, turmeric, and even cinnamon. Many of these contribute to variations of curries and masalas, trademarks of Indian dishes. In fact, the “curry powder” some of you may be familiar with, was commercially prepared as early as the 18th century and sold to the British Colonial government and army as they headed back to Britain. Today it is still being replicated. 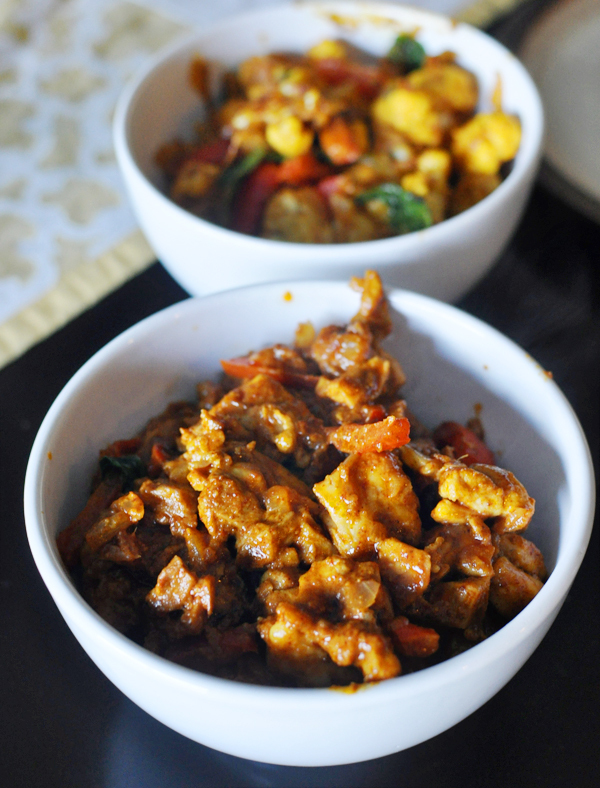 A commonly prepared Indian dish that I personally love is the masala. Masala is the Hindi word for spice and is sometimes translated to mean “hot mixture of spices.” A combination of green chilies, onion, garlic, fresh cilantro, desired spices, chickpeas, and tomatoes are ground into a paste and can be used to season other base ingredients. 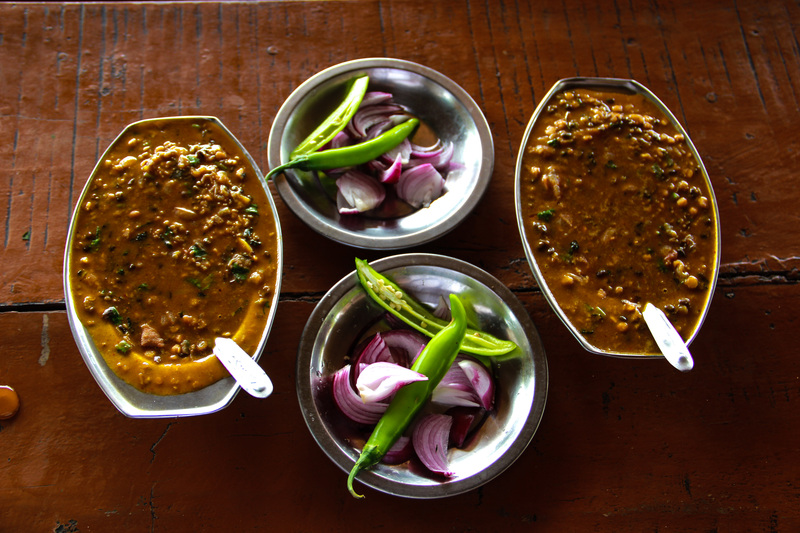 For example, the Tawa Mushroom Masala includes button mushrooms that are cooked into the masala, while Rajma Masala is made by mixing soaked and well-cooked kidney beans into the onion-tomato paste. Rajma Masala can be made to include butter and cream for a more comforting dish, similar to an American chowder. One fact that is important to note is the difference between curry and masala. Curry is usually a dish that includes a base of chicken, dark meats, fish, or veggies alongside or on top of lentils or rice. The curry refers to the spices the dish is cooked with – traditionally they are prepared in a sauce with a base of fresh or dried chili. Curry can be wet, like a sauce, soup, or gravy. On the other hand it can be dry, when the liquid evaporates and the base is coated in the spice mixture. You may have had this before as curry chicken, which packs a lot of flavor but isn’t surrounded by sauce. So, if you haven’t had the chance to visit India, or you have and are feeling nostalgic, try your hand at creating one of these traditional meals. Indian cooking has the powerful flavor profile that is unique to the culture and will be sure to take you on a journey as you travel by taste.